Most carbon in the soil is lost as greenhouse gas (carbon dioxide, CO2) into the atmosphere if natural ecosystems are converted to agricultural land. Soils contain 3.3 times more carbon than the atmosphere and 4.5 times more than plants and animals on earth (1). This makes soils an important source of greenhouse gases but also a potential sink if right management is applied. The use of crop residues for bio-energy production reduces the carbon stocks in cropland. Further the dedication of cropland to bio-fuel production increases the area of cultivated land and thus carbon loss from soils and vegetation. Pyrolysis of waste biomass can generate fuels and biochar recalcitrant against decomposition. If biochar is returned to agricultural land it can increase the soil’s carbon content permanently and would establish a carbon sink for atmospheric CO2. In this case the use of crop residues as a potential energy source may improve soil quality and reduce greenhouse gas emissions in a complementary not competing way. Biochar is proposed as a soil amendment in environments with low carbon sequestration capacity and previously depleted soils (especially in the Tropics). From previous studies it is known that soil biochar amendments increase and maintain soil fertility (2) and the human-made Terra Preta soils in the Ama-zon prove that infertile soils can be transformed into fertile soils and long term carbon enrichment is feasible even in environments with low carbon sequestration capacity (3). Read more about the global carbon cycle, climate change, soil organic carbon and our options and prospects to mange this carbon pool by biochar carbon sequestration. Throughout the world intensive agriculture often has resulted in soil physical and chemical degradation, to due erosion and higher output than input rates of nutrients and OM. In contrast, the intentional and unintentional deposition of nutrient-rich materials within human habitation sites and field areas has in many cases produced conditions of heightened fertility status (Woods 2003). Biochar was also used in agriculture in the past (Allen 1846; Ogawa 1994; Ogawa 2008), but Terra Preta soils in the Amazon are among the most prominent examples of human enriched soils. Sustainable soil fertility management is a major constraint in the humid tropics and is probably one reason for Terra Preta’s high degree of public awareness. Further the difference between Terra Preta and ordinary soils in its vicinity is striking. In contrast to yellow or reddish Ferralsols the Terra Preta is dark (black). Terra Preta is rich in calcium and phosphate. These two elements are scarce in the Amazon basin and its presence alters fertility and ecology of the landscape distinctly. Terra Preta has an elevated pH in comparison to the surrounding soils (Ferralsols, Acrisols, and Arenosols) which are acidic with toxic levels of exchangeable aluminum (Glaser and Birk 2012). Current major environmental threats such as deforestation and global warming contribute to Terra Preta’s wide public perception. Its existence proofs that long-lasting soil fertility improvements and carbon sequestration is possible, even under the most unfavorable circumstances (fast mineralization and leaching) and gives rise to hope to overcome these environmental challenges. Terra Preta may offer an opportunity to learn from the past and improve our current wasteful material flow management (Steiner and Taylor 2010). The existence of an anthropogenic and carbon (C) enriched dark soil in different parts of the world and especially in Amazonia (Amazonian Dark Earths (ADE) or Terra Preta de Índio) proves that the predominant Ferralsols and Acrisols can be transformed into fertile soils. Charcoal formation and deposition in soils seems to be a promising option to transfer an easily decomposable biomass into refractory soil organic matter (SOM) pools. 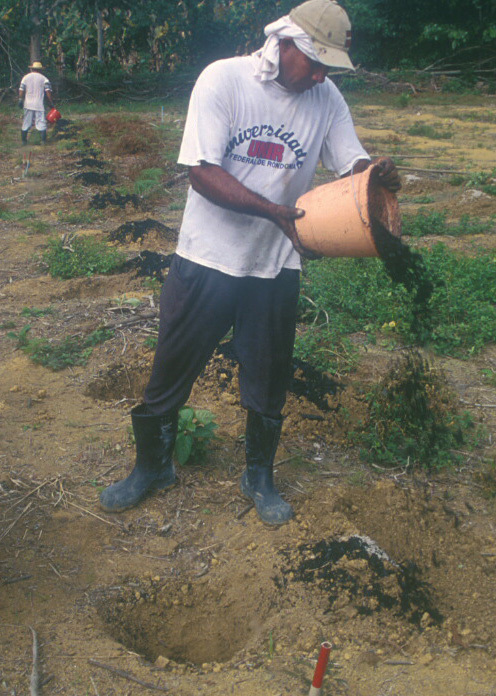 The production of charcoal for soil amelioration purposes (slash and char) out of the aboveground biomass (secondary forest and crop residues) instead of converting it to carbon dioxide (CO2) through burning (slash and burn) could establish a C sink and could be an important step towards sustainability and SOM conservation in tropical agriculture. On a global scale, crop residue biomass represents a considerable problem as well as new challenges and opportunities. Bio-char soil management systems can deliver tradable C emissions reduction, and C sequestered is easily accountable, and verifiable. The described mixture of driving forces and technologies has the potential to use residual waste carbon-rich residues to reshape agriculture, balance carbon and address nutrient depletion.